Ex. 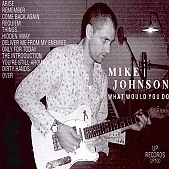 Dinosaur Jr. member Mike Johnson's latest, What Would You Do, is a dark, slumbering pop record, a moody mix of splendid pop melodies, well-written, melancholy lyrics, and Johnson's dark, deep voice, which gives the music its not-so-pretty finish. From the serenade of "Only For Today", the eerie instrumental "Requiem", and the haunting "Deliver Me From My Enemies", through the contemplative "You're Still Around", Johnson's fusion of the mysterious with the melodic makes What Would You Do a winner. I'll give it an A-.